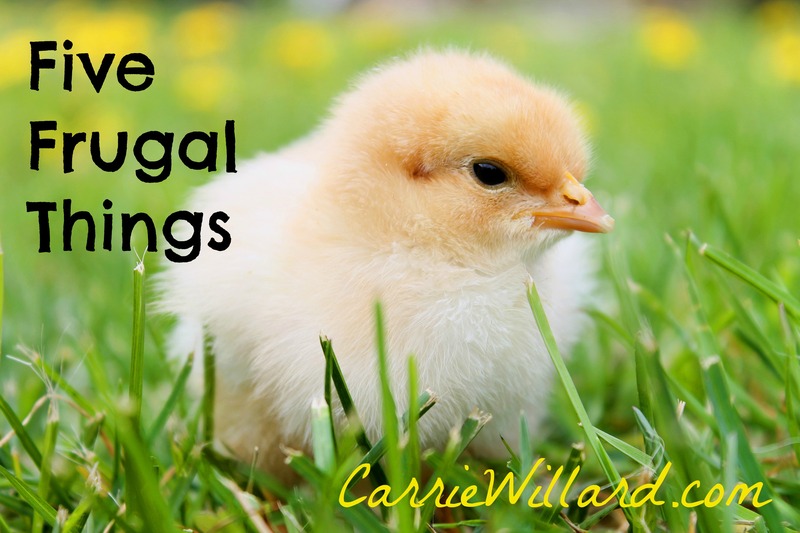 Quite randomly, I post 5 frugal things I’ve been up to. I find these posts fun to read on other people’s blogs (they give me tightwad inspiration!). I had an old sofa to get rid of, so I called our disposal company and scheduled a pickup. They were going to charge me $40 for the service. Instead, I put the sofa outside with a FREE sign on it and the next morning it was gone. I walked into Starbucks, where I work every morning at the dark:thirty, and spotted a very large roach on the table where I usually sit. I grabbed a handful of napkins and killed it. The barista gave me a free coffee for my trouble. Is this what you would call perks? Got a belt from ThredUp, free after referral credits. Got 3 dresses for my mädchen (or would she be fräulein? ), whose German genes cause her to grow taller every month, also from ThredUp, with a 10% coupon off their already low consignment-store prices. I’m brainstorming a post called “How to dress t(w)een daughters without going broke“. The short answer is, woo them to secondhand clothing. This particular child used to hate thrifting and insisted on getting her clothes new. I went along with it for a while, trusting that she would soon figure out that new clothes doesn’t always mean quality. Indeed, she learned that Target stuff tears up in the wash, and now she shops for specific, high-quality brands at consignment and thrift shops. Smart girl! About twice a year, I head to IKEA to restock my kitchen with plates, mugs and glasses. I find they have the best prices, and with all these kids (and a rather clumsy mama), we break a lot of dishes. Plus, IKEA is an experience, and it’s a cheap date with hubby. As card-carrying IKEA family members, we get free coffee each time we visit, and desserts were BOGO. Two of the kids played in Smaland while we sipped our coffee. 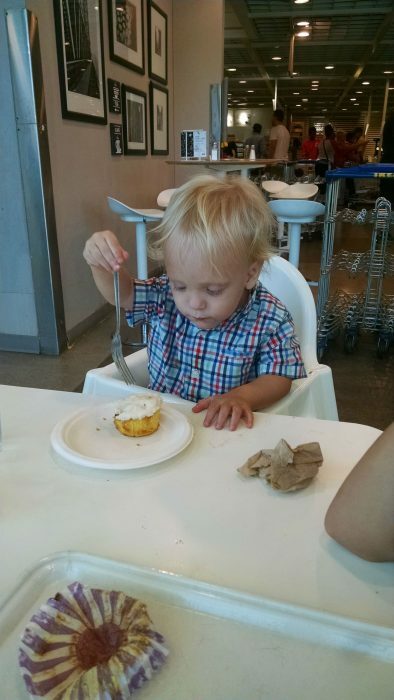 Baby got a free cupcake, which he tried to eat with a fork. I must be tired, because the other day when I made myself an oatmeal-apple muffin, I dumped chili powder on top of it, thinking it was cinnamon. I wasn’t about to waste this precious treat, so I shook off as much of the offending spice as I could and baked it. You know what? It wasn’t awful, just different. Read more 5 frugal things/recent frugal accomplishments. Up to any frugal adventures lately? I have always been afraid that I’ll mix up cumin and cinnamon because until recently, the Aldi containers for those two spices were almost identical!